Back in 2014, when Amazon Echo launched, it was the only smart speaker on the market. It was always on, always listening, and always ready to help you make lists, order a pizza, find a Lyft, control your smart home and so much more. Over the next few months and years, the Alexa-powered speaker evolved, but the marketplace became crowded with rivals launching their own smart speakers. It became evident Amazon risked losing its first-mover advantage, till it took a giant evolutionary leap. In March 2016, Amazon launched the The Amazon Echo Dot and it was a game-changer, because it offered all of these functionalities at a very affordable price. While the Amazon Echo retails for $180, the Amazon Echo Dot (2nd Generation) sets you back a mere $50. The Amazon Echo Dot proves that good things do come in small packages! What can the Dot do for you? The Amazon Echo Dot runs on Alexa, which means a pretty impressive range of skills to begin with. Add Alexa Skills to that, which are third-party apps developed for the Alexa platform, and you’re looking at a pretty sweet set of uses. The place where the Dot really shines is when you’re relaxing at home. It can wake you up and keep you company by reading out the news while you brush your teeth, answer your questions while you shave and ask it about stock prices or what your Fitbit says about how you slept last night, or give you something to sing along to in the shower. If you’ve finished the milk during breakfast, it’s unlikely you’ll remember to pick some up of your way home, unless you set a reminder for it on the Dot on your kitchen counter. Connected to your smart devices, it’ll switch off the lights and turn the thermostat down for you when you’re leaving for work. And when you get back, you needn’t fumble in the dark for light switches while juggling shopping bags and trying not to step on the cat, because Alexa can get the lights for you when you ask. You can order pizza through it, and ask it to change channels for you without hunting for the remote. If you’re scheduled to head out to meet friends instead, it’ll remind you. And feel free to book an Uber or Lyft through it. If you’re staying in and cooking, a few easy-to-set timers will really help. Plus, it connects with Joule or the Anova Precision Cooker, so you can use voice commands to start, stop or change the temperature, apart from asking for cooking guides or recalling how long you cooked that steak for last time. Alexa will even help you out with wine or beer pairings when you’re ready to eat. The Amazon Echo and the Amazon Echo Dot are similar in terms of what they can do, but the real difference comes in when you compare what their strengths are. The Amazon Echo is a 10” tall speaker (similar to a Pringles can) with decent voice quality, while the Dot looks a bit like a hockey puck and is barely passable as a speaker. The Echo is a better bet to stream music off Amazon Music, Spotify or the radio, or read out your Kindle books or audiobooks from Audible for you, because Dot’s tiny size means its sound quality is tinny at best. But that size and its low price point ensures you can easily have one in every room to control smart devices, answer questions, tickle you with trivia or organize your day. The Amazon Echo Dot can do absolutely everything that the Echo can. If sound quality is a crucial factor for you, you could either buy the 10” tall Amazon Echo speaker, or hook your Dot up to your existing sound system. Is the Dot right for you? Although the nifty little Dot does seemingly everything, it comes with its limitations. It doesn’t allow for complex integrations of multiple devices. What that means is that you can’t get it to play a Christmas carol at soon as you turn on a red light for instance. You’d need to do that in an app like IFTTT, which allows you to create “recipes”. 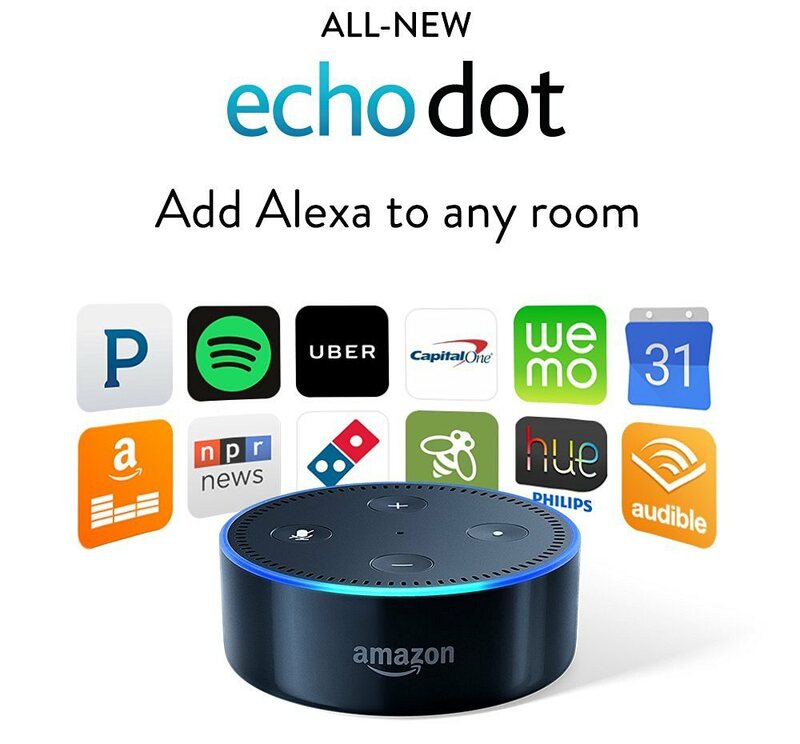 The Echo Dot won’t be the brains behind it, although it’ll gladly be a team player and find you a christmas carol and play it for you as well as it can. That brings us to the other drawback of the Dot: it has a thoroughly underwhelming speaker. The Dot is great as a smart home controller and as a digital assistant. What it doesn’t do so well with is playing music. With a speaker this small, bass notes are naturally hard to achieve and sound output is really barely adequate. You do have the option of connecting the dot to your existing sound system for music, or you could get the Amazon Echo or the Amazon Tap instead. See how the Dot can make your life simpler with all of Alexa’s handy little tricks, and by controlling these popular smart devices. You’re intrigued by smart devices and would like to invest in your first one, to see how useful it really is for your lifestyle, the Dot and a few smart light fittings are a great first step. If you often work from home and need some hands-free help scheduling, making calls, controlling your smart devices and getting you information while you multitask, the Dot would prove immensely helpful. Busy day? The Echo Dot will take notes and make calls for you, leaving your hands free to type. Your evenings and weekends are pretty packed, so a digital assistant would be useful to plan them. With Alexa’s help, you could make reservations and call a cab for you if you’re going out, or to order in the necessary groceries, control your smart cooking devices and set the mood with some relaxing music if you’re staying in. You need the Dot to remind you to hit the gym, and it is a fabulous virtual assistant in the home gym to set timers for your workouts as well as find you the right music to get you pumped. Heading out for a jog? Ask it for a weather update before you do! Over the years, Alexa has evolved to become a very powerful tool to make our lives easier, and the Dot offers you all that at a very affordable price. The Amazon Dot is a great start to upgrading to a smart home and it really makes sense to buy this handy little dude if you are looking to couple it with a smart light or other smart devices. The Dot, in isolation, has limited use, but if you pair it with other smart devices, you’ll find it can suddenly do a lot for you without the costs normally associated. Of course there are other smart speakers from other manufacturers, including the Google Home, Invoke by Harman Kardon and Alibaba’s Tmall Genie, which are rapidly evolving as strong competitors. Samsung’s Bixby speaker and the Apple Homepod are all set to launch by the end of the year. And Xiaomi’s unveiled Mi AI smart speaker recently on July 26 2017 and is in Beta test phase with a select group of 1000 users. When launched, this speaker is expected to retail at $44, which is comparable to the Echo Dot, but the larger size gives us hope that the sound quality would be much better than the latter. However, till it launches, and irons out the bugs that each AI inevitably has, buying the Amazon Echo Dot is probably the best way to control your smart devices and get access to Alexa’s features and 10,000+ “Skills” and all the conveniences that it brings to the table, at a very affordable price.